In team digital we like to make things look easy, and in doing so we hope to make life easier for people. A recent challenge has been how to recreate the Top sales by product analysis from the Shopify web application in Google Docs to see how the top 10 selling products compare month by month. The task of creating a monthly breakdown of product sales had up until now been a manual task of choosing from a date picker, exporting data, copying to google sheets, etc. Having already had some success pushing and pulling data to google sheets using google apps script and our Culture Data platform, we decided to automate the process. 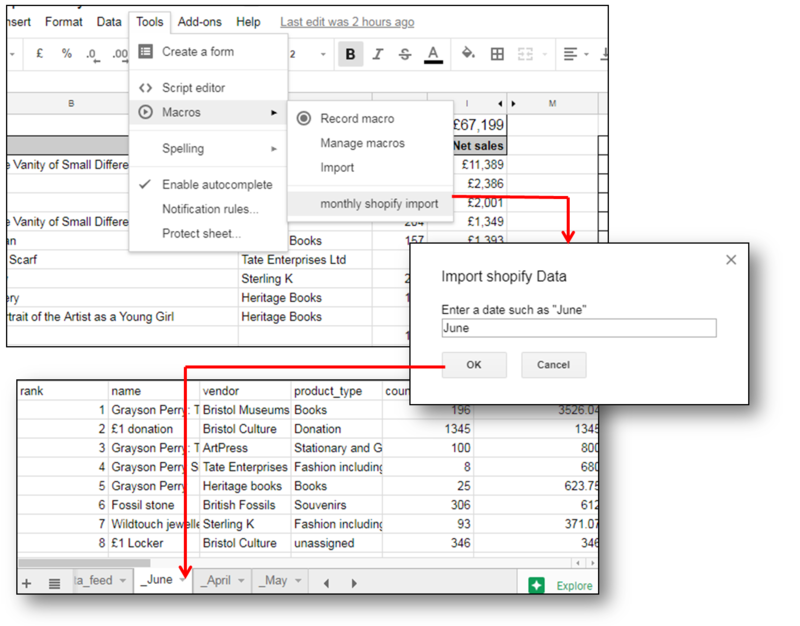 The goal was to simplify the procedure of getting the sales analysis into Google docs to make it as easy as possible for the user – all they should need to do would be to select the month they wish to import. We have developed a set of scripts for extracting data using the Shopify API, but needed to decide how to get the data into Google Sheets. Whilst there is a library for pushing data from a node application into a worksheet, our trials found it to be slow and prone to issues where the sheet did not have enough rows or other unforeseen circumstances. Instead, we performed our monthly analysis on the node server and saved this to a local database. we then built an api for that database that could be queried by shop and by month. The next step, using google script was to query the api and pull in a month’s worth of data, then save this to a new sheet by month name. This could then be set added as a macro so that it was accessible in the toolbar for the user in a familiar place for them, at their command. As the data is required on a monthly basis, we need to schedule the server side analysis to save a new batch of data after each month – something we can easily achieve with a cron job. 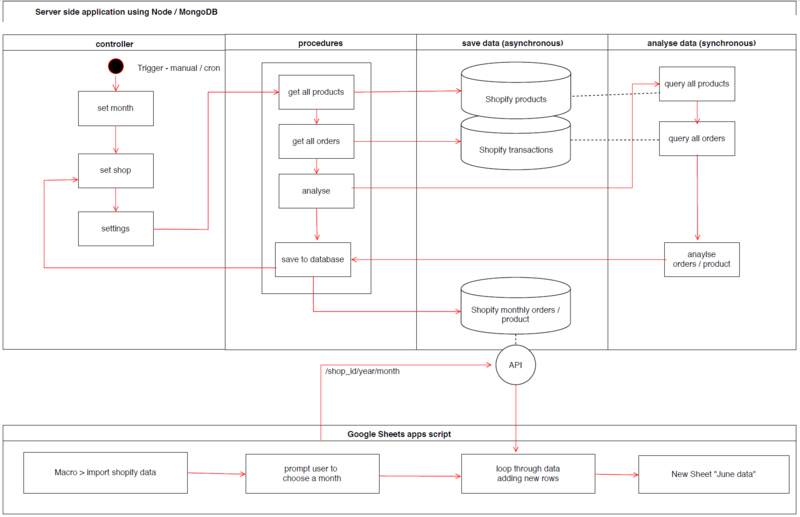 The diagram below shows roughly how the prototype works from the server side and google sheets side. Interestingly, the figures don’t completely match up to the in-application analysis by Shopify, so we have some error checking to do, however we now have the power to enhance the default analysis with our own calculations, for example incorporating the cost of goods into the equation to work out the overall profitability of each product line. Any other museum digital people getting an influx of requests for QR codes to put in galleries recently? No? IS IT JUST US?! After an attempt to fend them off we realised that we didn’t really have any evidence that people don’t use them. At least nothing recent or since the introduction of automatic QR code scanning with iOS 11 last year (thanks for that, Apple). So, we thought we’d test it out, making sure we’re tracking everything and also always providing a short URL for people to type into browsers as an alternative. However, then we come to our recent Grayson Perry exhibition at Bristol Museum & Art Gallery, which had audio content which was ‘extra’ to what was in the exhibition. We provided headphones but visitors used their own devices. A key difference with this one though was that our front of house team facilitated use of the QR codes, encouraging visitors to use them and showing them what to do. As such, the six audio files (there was one with each tapestry on display) had 5,520 listens altogether over the course of the exhibition (March – June), over 900 each on average. Whilst it’s great that they were used – it threw us a bit – the flip side of this is that it was only in an instance where it’s being facilitated. I’m not partuclarly keen on using something that we’re having to teach visitors how to use and where we’re trying to change users’ behaviours. There’s also some more here around the crossover between online and gallery content (should we be using one thing for both, are they different user cases that need to be separate) which we’re talking about and testing more and more at the moment, but that’s one for another post. We’d be really interested to hear your thoughts on triggered content. Do people even know what QR codes are? Are ‘just because we can and they’re no/low cost’ reasons enough to use them? How do you do triggered content? Is this unique to medium-sized museums or are the big and smaller guys grappling with this too? Or is it really just us?! Can neural networks help us reinterpret history? How to nail it in Team Digital by turning it off.